NOW: Yesterday we played outside on a very windy day! Just for a little while because it was actually chilly. 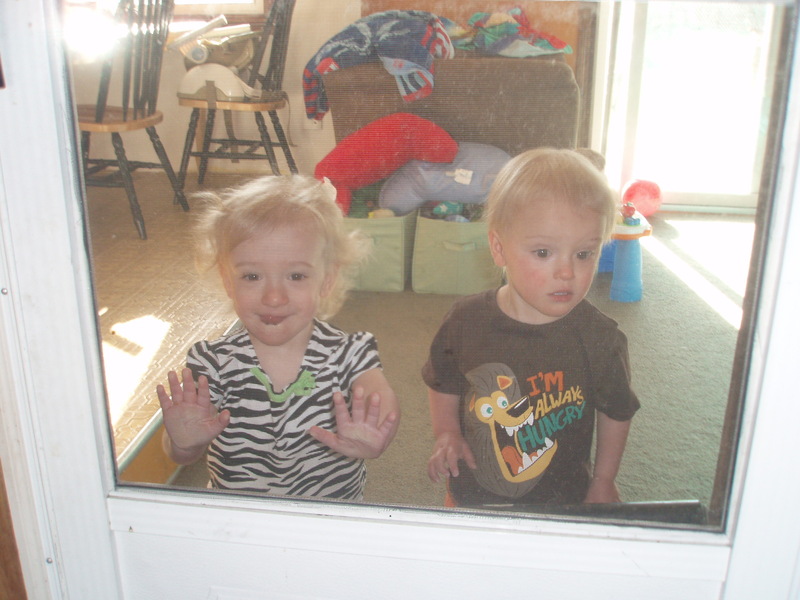 But after hanging out inside all morning, the twins were ready to go “OUT”. Ariel picked flowers and gave them to Mommy. 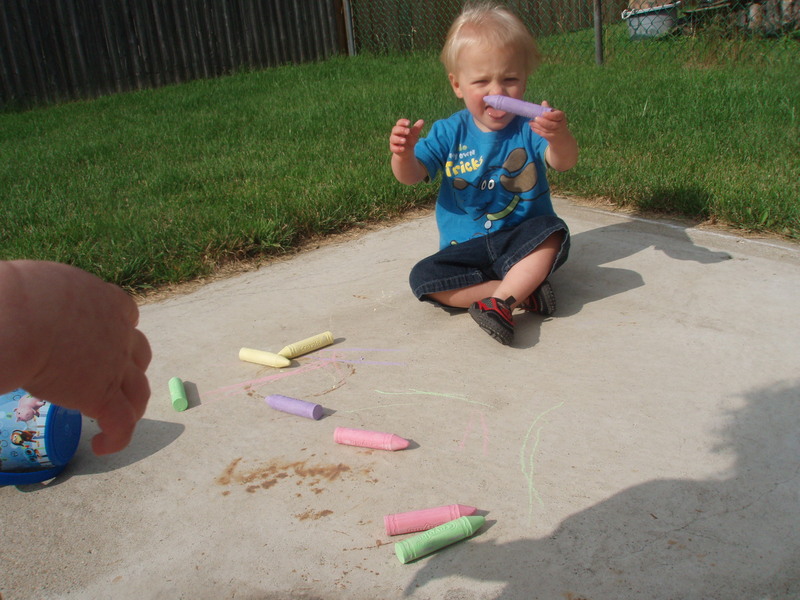 Then, we all drew with chalk. We have a concrete slab in our backyard that our shed used to be on. We are building a new shed this summer, but until then it’s the perfect place for chalk! This was like an epiphany for me. Going in the front is kinda nerve-racking, especially since Will doesn’t really want to sit still and do chalk for as long as Ariel. So keeping him happy in the front is harder because there’s the “street factor”. In the back, he would wander away when he got a little bored and then come back. 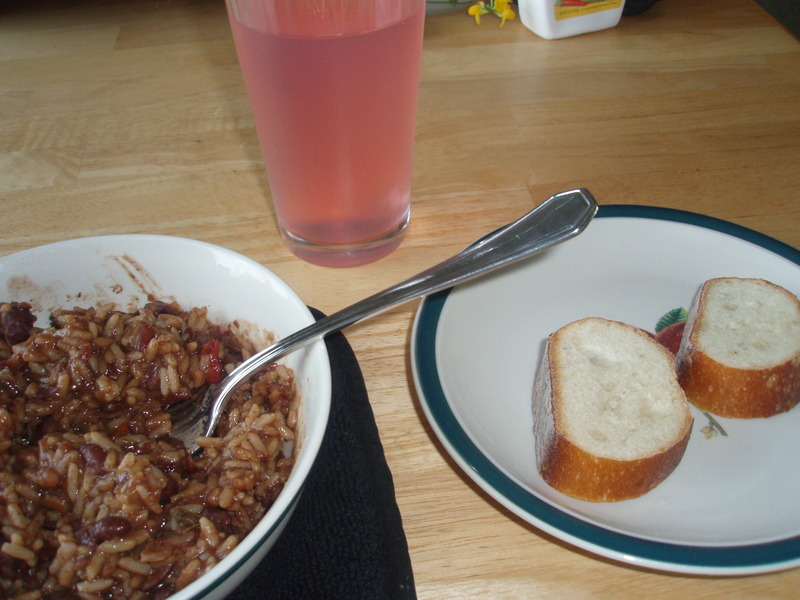 I was on my own again for dinner, so I re-heated some beans and rice in the microwave for myself with a couple pieces of bread and a tall glass of pink lemonade Kool-Aid (made with Splenda so I don’t feel guilty about the calories/sugar). I also used a little bit of spray butter on my bread. The twins had peanut butter and jelly strips and Ariel actually ATE THEM!!! Yay for Mommy’s persistance. 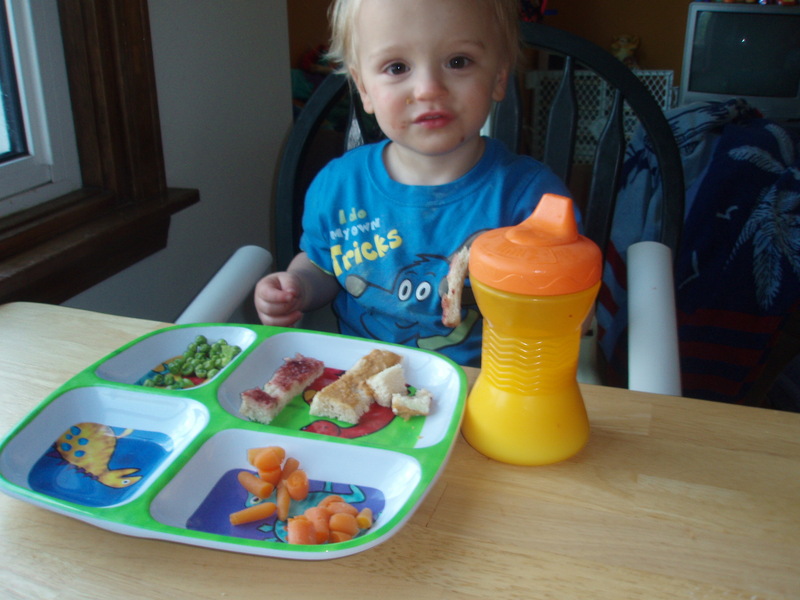 Will ate the jelly off the bread – an accomplishment for him. 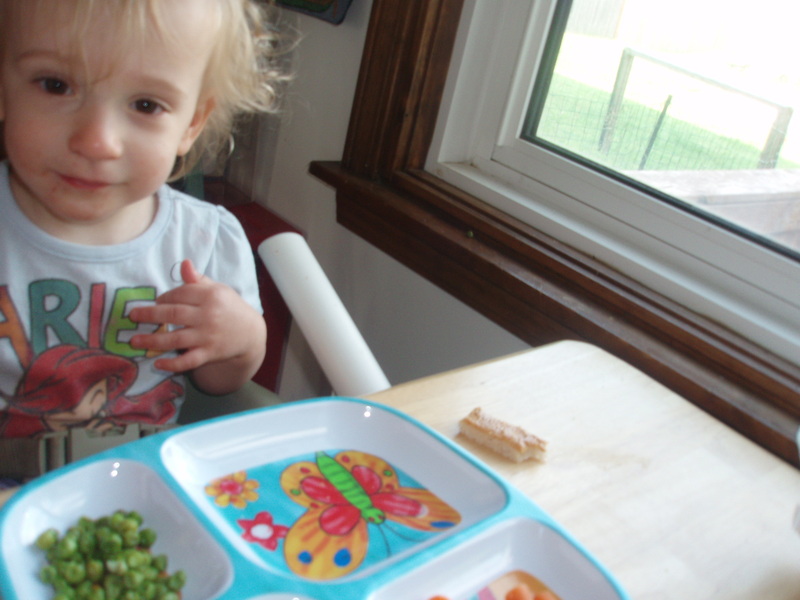 This morning we had plans to go to the zoo with Papa B. He had mentioned it a couple of weeks ago because he had off for an extended holiday weekend. I dressed them in coordinating outfits for our trip. Ariel in a lovely zebra print, and Will in a lion-themed ensemble. They were watching me as I loaded up the car. 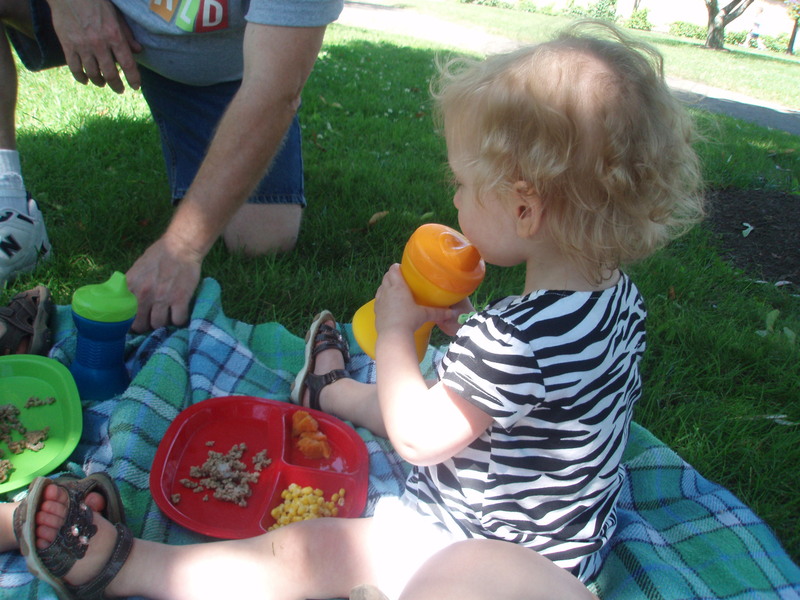 Stoller, diaper bag, food bag, drink bag, Mommy’s purse, and a blanket to sit on while we ate lunch. They were VERY excited! Don’t let anyone tell you that kids don’t remember things. They do. 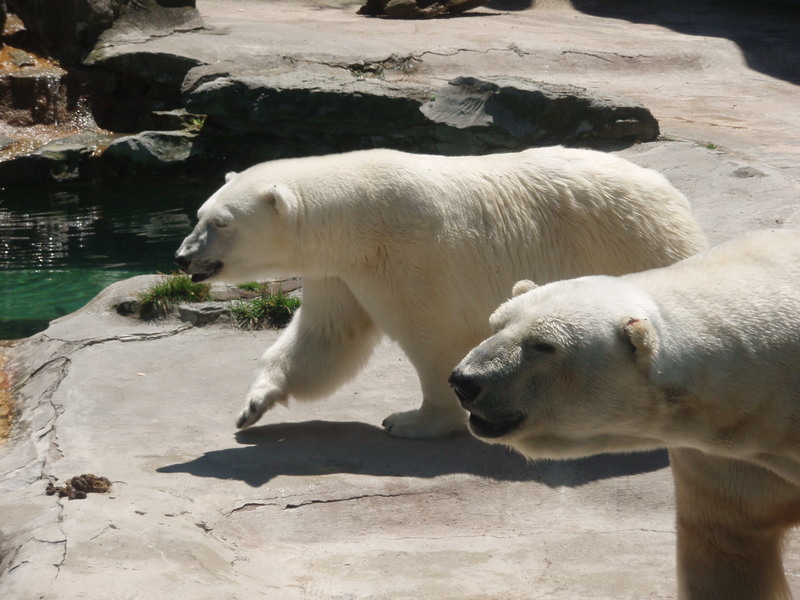 They haven’t been to the zoo in probably a month (I have a membership to our Buffalo Zoo). 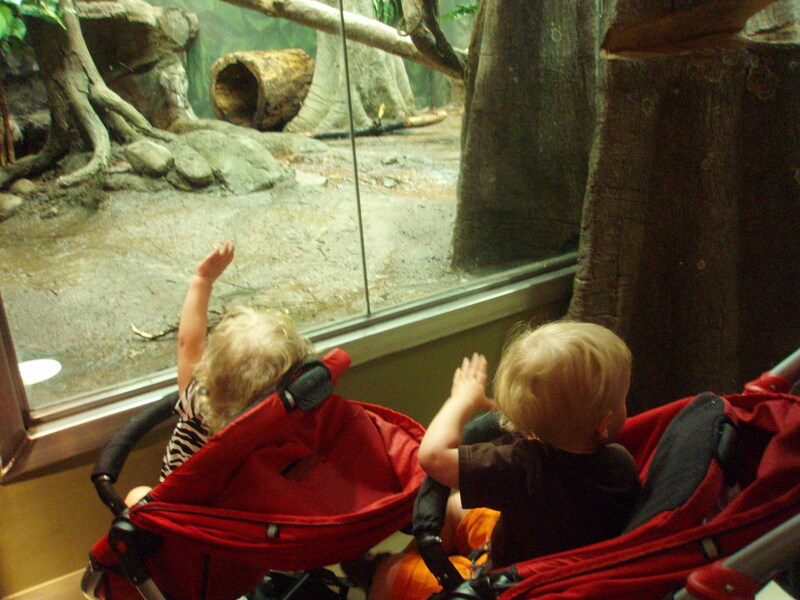 But yesterday, when Mema stopped by she asked them what they were going to see at the zoo. They responded “animals”. I think she was shocked. I know I was. 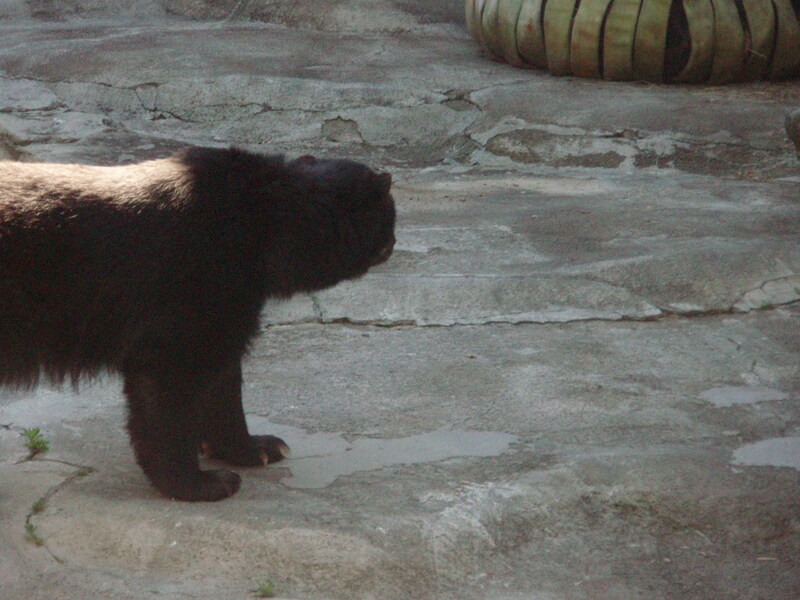 Looking at the Kodiak Bear. 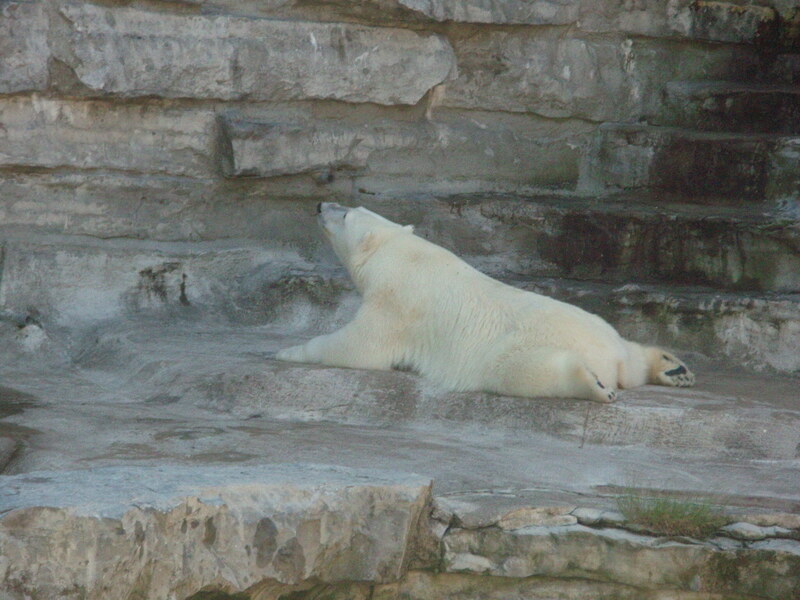 The bears and any water, are their favorite things at the zoo. They kept asking to come back to the bears. We got there pretty early so it wasn’t too crowded at first. I love, love, love my stoller by the way. I could write a whole blog post just on that. And I get TONS of compliments on it! 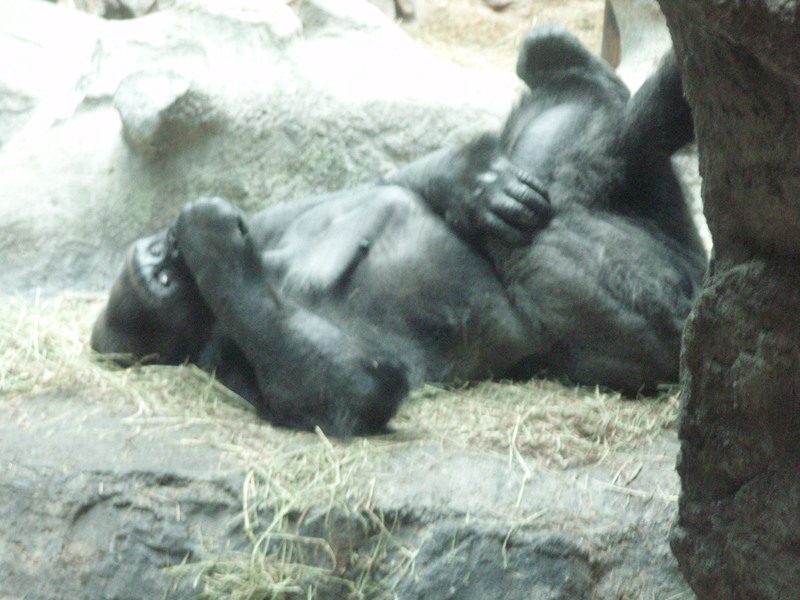 The highlight of the trip for me, anyway) was the Gorillas. 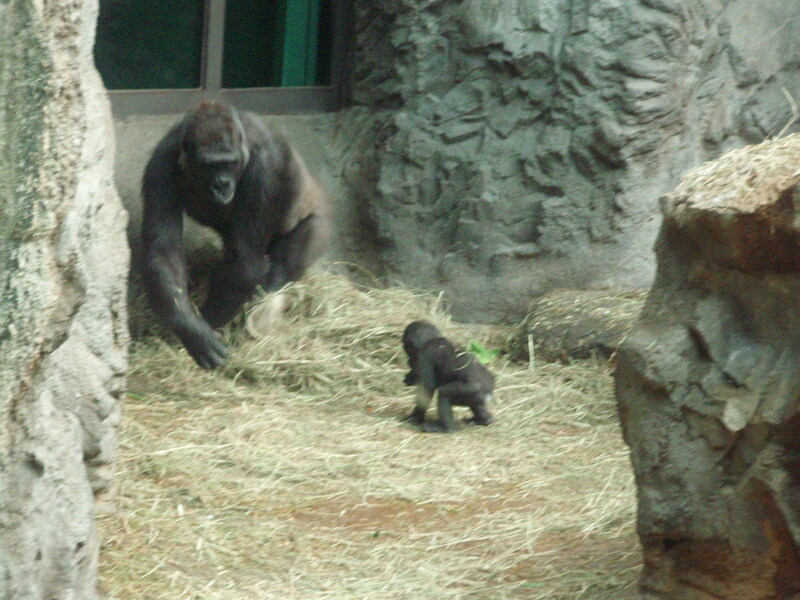 There’s a new baby, and the whole family, Daddy, Mommy and Baby, were all walking around and laying near the glass. The baby was even playing peek-a-boo, which the twins thought was hilarious! 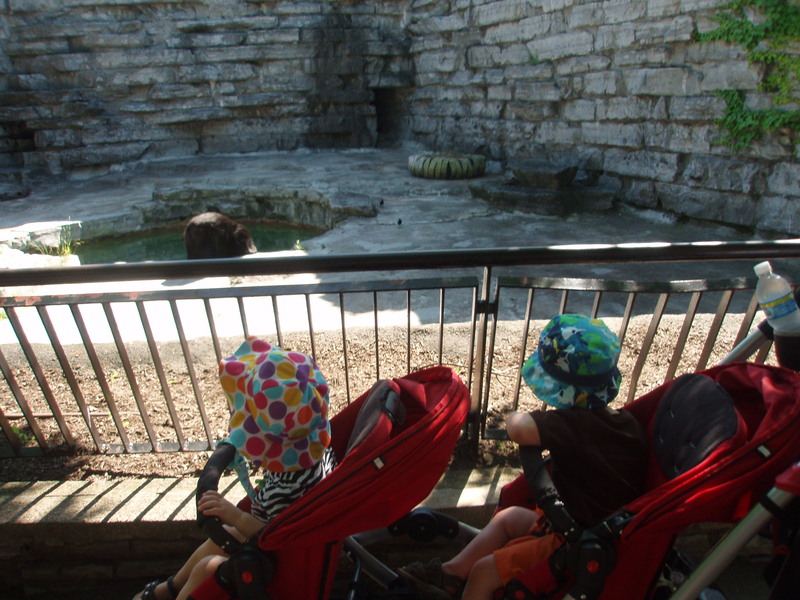 They kept yelling “MOMMY, BABY, DADDY” and pointing to the different gorillas. 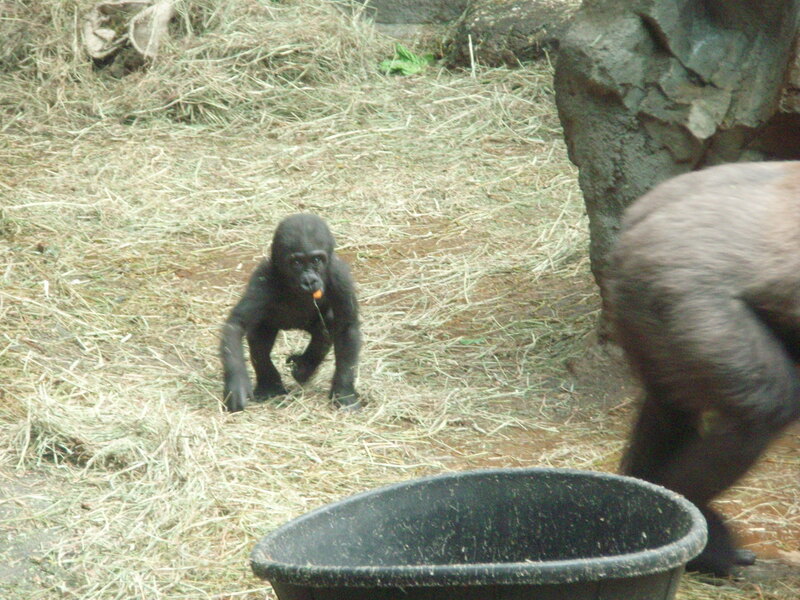 Awwww…..look at the baby! So cute! The lion was also pretty active. He kept pacing back and forth. The twins were roaring at him. 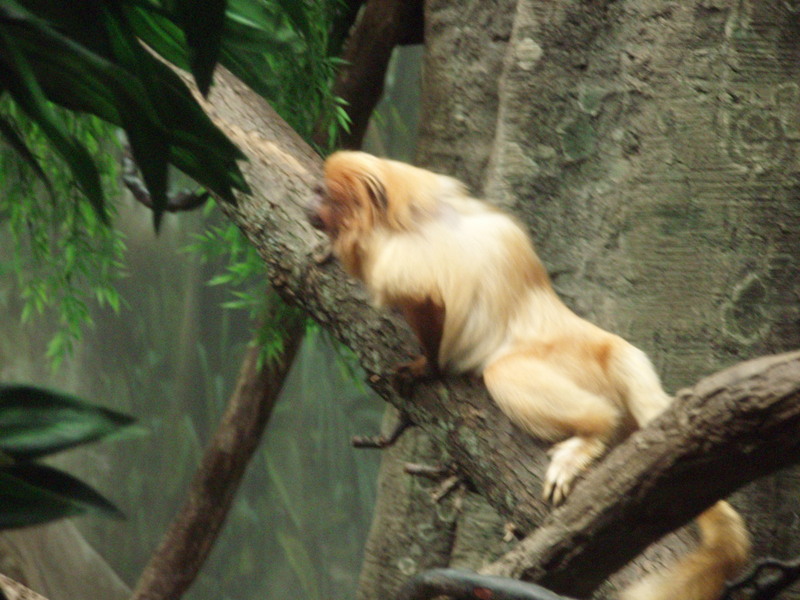 We also saw some Golden Lion Tamarins that were jumping all around and swinging from branches. 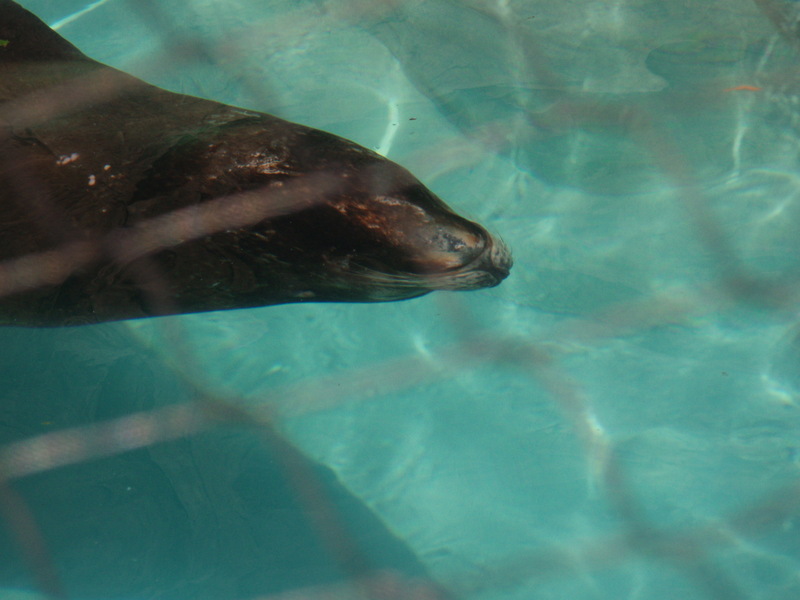 And a Sea Lion that kept swimming around. 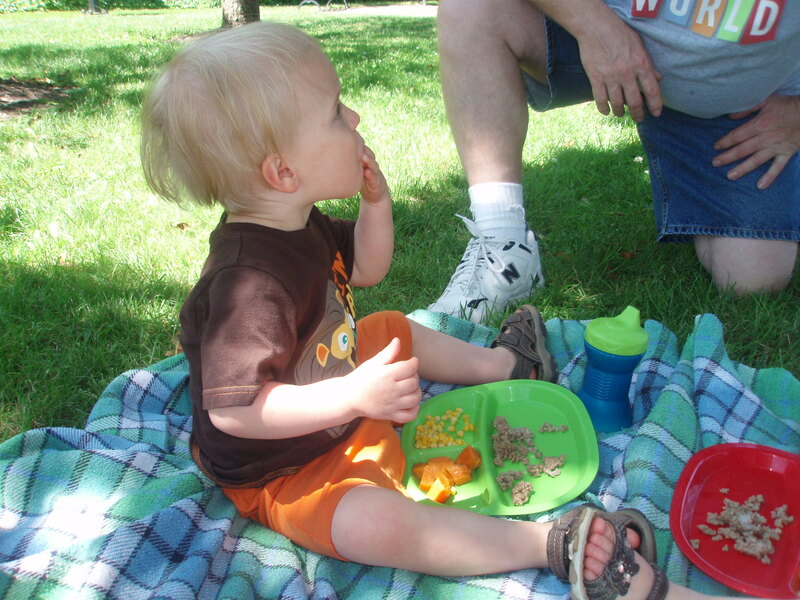 We had a nice picnic lunch. The seagulls were trying to be very friendly, which the twins enjoyed. Then we let the twins walk around a bit. They were getting tired of sitting in the stroller. So Papa pushed the empty stroller while I held hands. There were a few things we had skipped because the twins would need to walk into them anyway, so it was easier than getting them in and out and in and out. 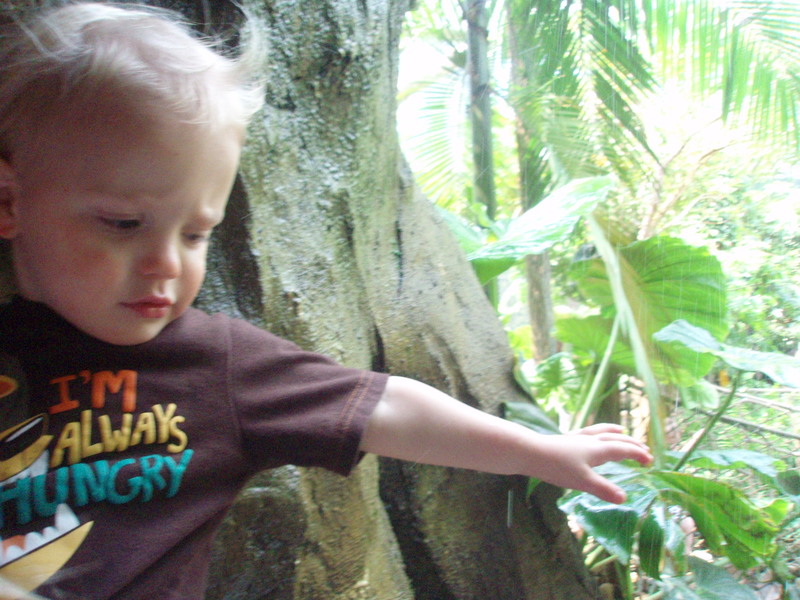 First we stopped by the Rainforest exhibit. 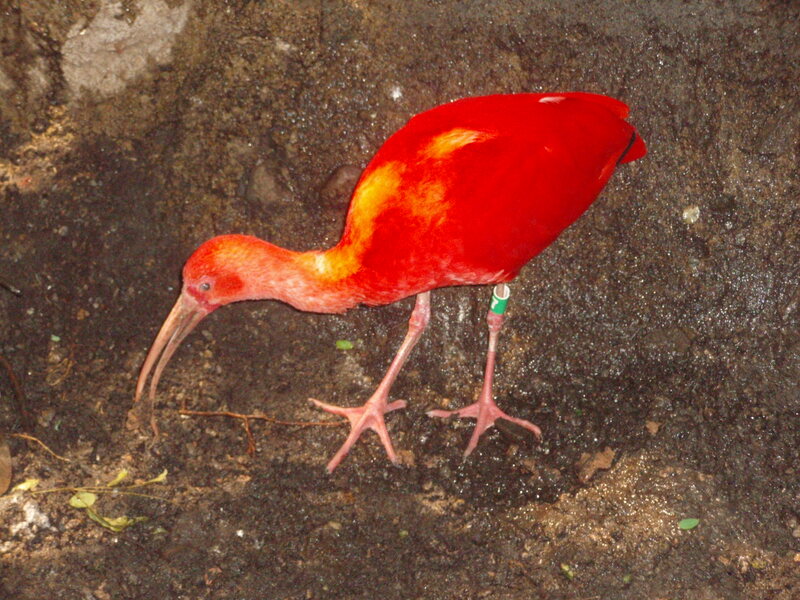 We saw scarlet Ibis. 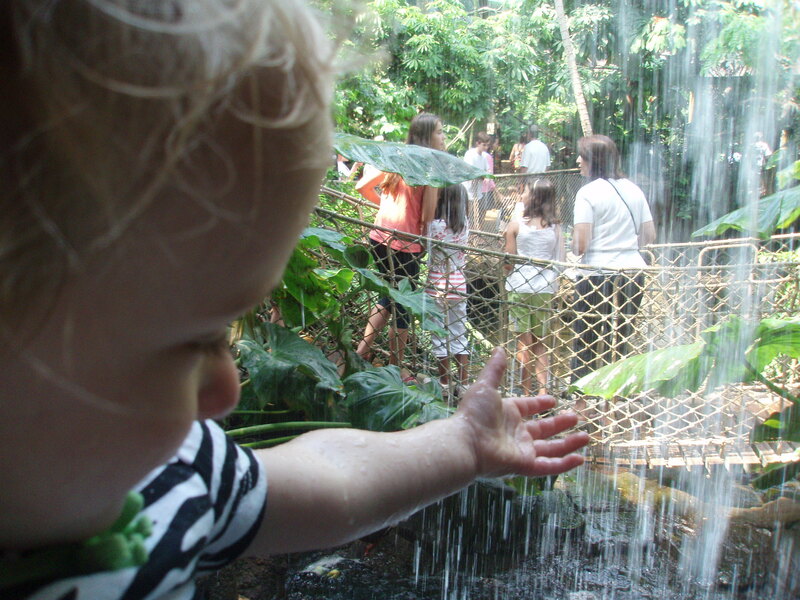 And the twins LOVE touching the waterfall. We’re going to have to take them to Niagara Falls soon. Then we went to the duck pond, where they also had some swans. 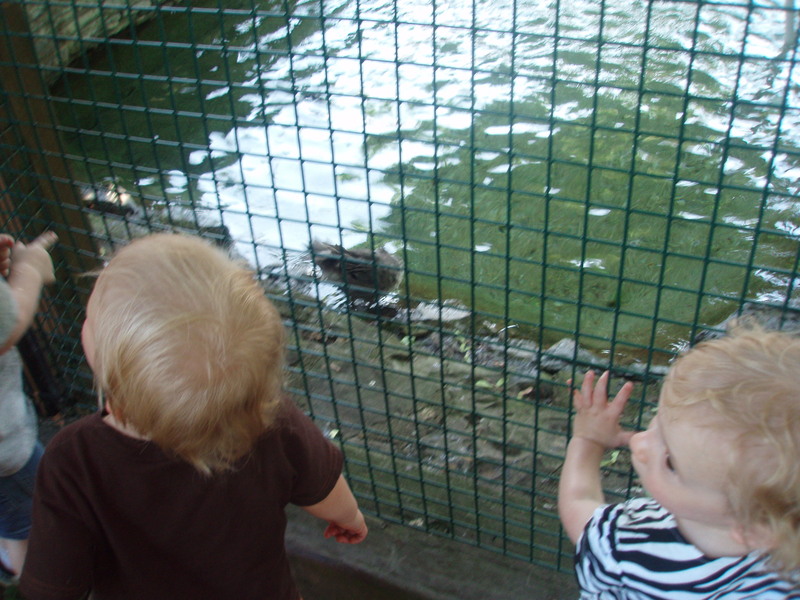 There was a mesh “cage”, but the ducks got really close, so the twins loved that. Then we went to the petting zoo part, which used to be really cool when I was a kid, but I guess someone decided it was too dangerous to just have kids and animals running around in a pen together. So, it’s a little more controlled. 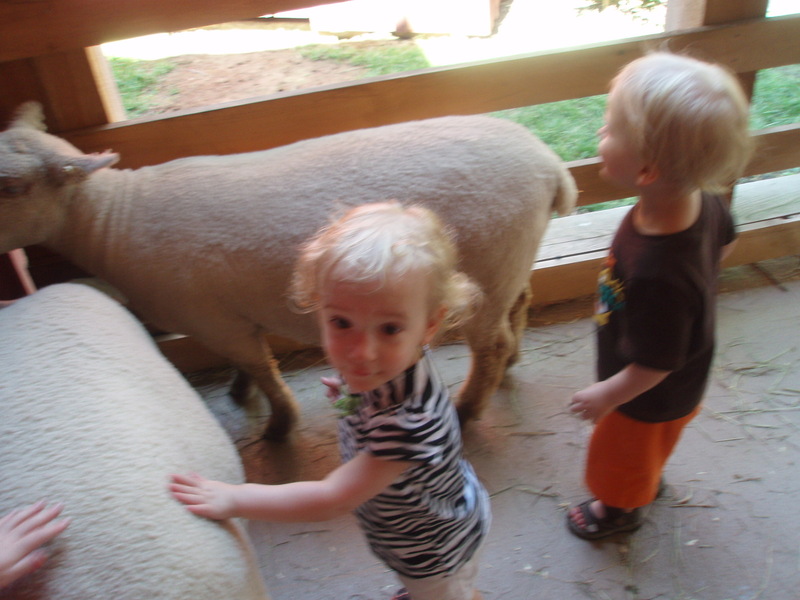 And we only got to pet the sheep. I always tell the twins “pet it nice”, so now whenever they want to pet something they ask “nice?”. 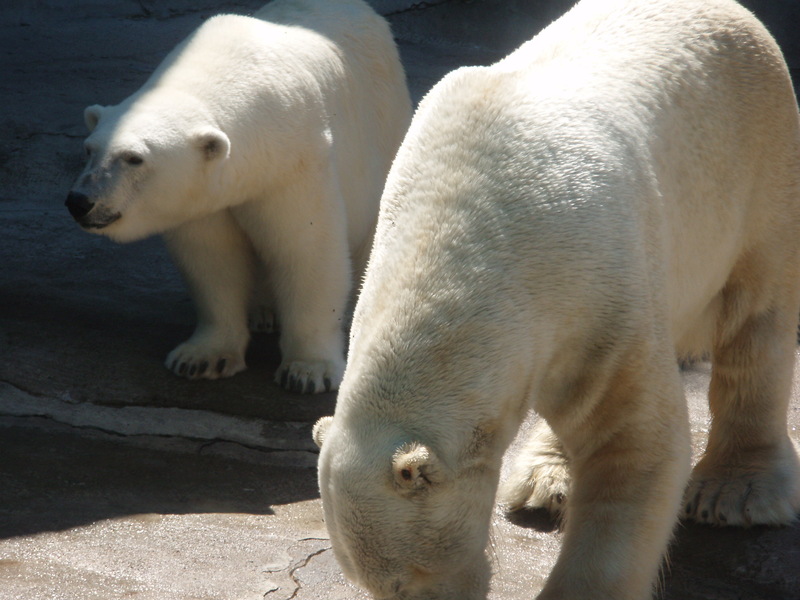 On the way out, they asked to see the bears again, so we made a detour to see the polar bears for the third time. But hey, we’re here for the kids right? Who cares if they wanted to see them again! Them kept yelling “swim” “wa-wa” “bears”. But apparently the bears were not interested in swimming at that time. 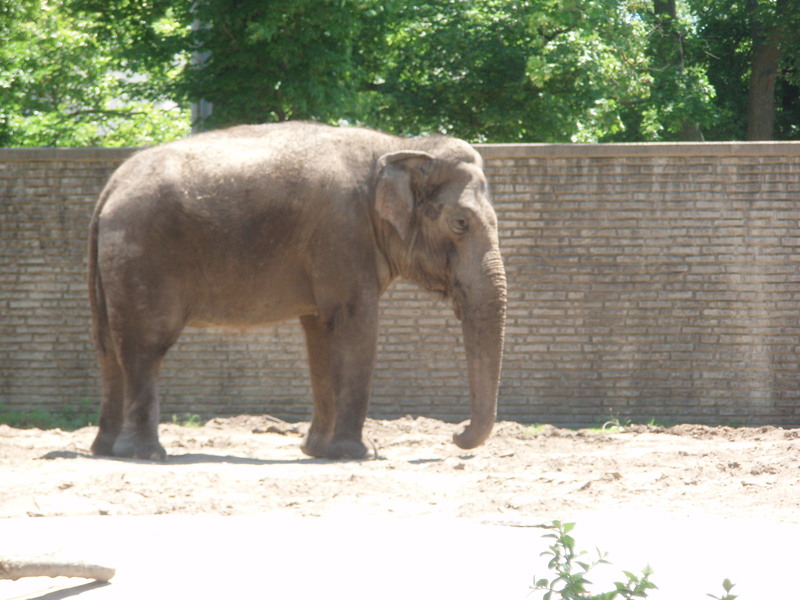 Our last stop was the elephant because he wasn’t there when we came in. By then, the twins were TIRED OUT! They fell asleep in the car before we left the parking lot. So, therefore, it must have been a good day! Good thing Mommy got a membership. We’ll go back next week! A lot of people don’t like our Buffalo Zoo, and I have to admit, I have been to bigger ones (Toronto), better ones (Washington D.C.), but for the twins, this was is JUST RIGHT. This is now. THEN: One of the nice things about being at a fertility clinic is all of the sonograms you get. 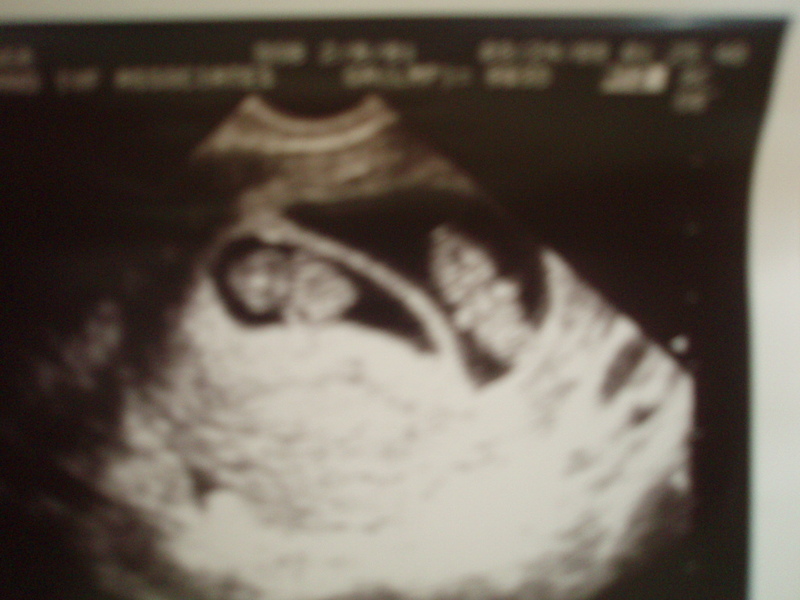 One of the nice thing about having multiples is all the sonograms you get. They look like little marshmellow people!!!! Baby A and Baby B. It was so much fun being able to see them grow every few weeks. 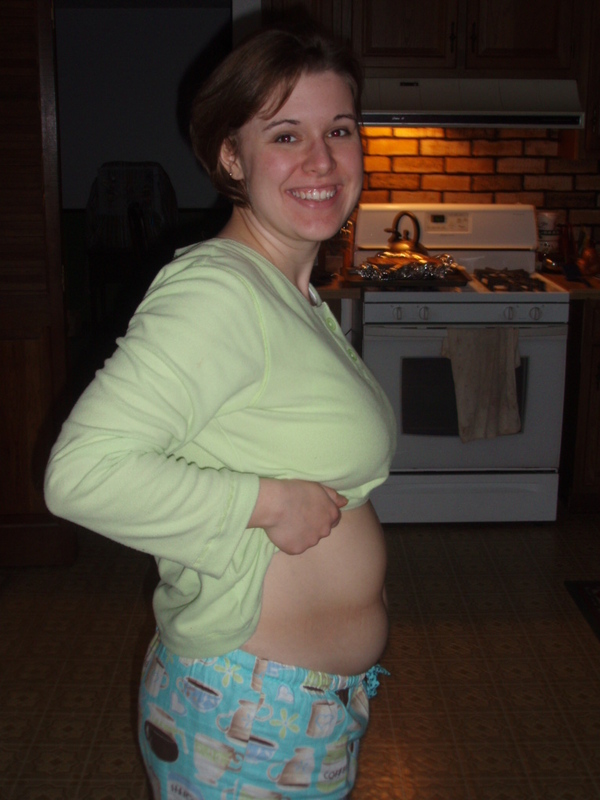 When I first was pregnant, there were just a few food aversions that I had. And I made sure to eat like every 2 hours because otherwise I felt a little nauseus. So I kept crackers in my desk at school, in my purse, and next to my bed. Just in case. I didn’t feel like drinking coffee. Which was good. I wasn’t going to drink coffee my first trimester anyway, but I had insisted that I would drink it later because I didn’t want to give it up. It was my only vice. But I drank much less, especially because I was pregnant through a summer. The other thing that made me feel sick? Water. Not good. How could I not drink water? I didn’t want to drink sugary things, or artificial sweetners. Luckily, putting lemon in it helped a lot. I didn’t used to like lemon in my water, but a friend suggested I try it. It worked miracles. So that was another thing I started carrying around with me. Crackers – not so crazy. But lemons in your purse? A little weird. Oh well. I told Tim we were going to take pictures of my growing belly every week. Yeah right. We got quite a few at the beginning, then we forgot, then we got more at the end. Here’s one of the first when I was showing. This was taken March 26, 2009. So, about 2 months preggo. At about 12 weeks I was released from the fertility clinic to my regular OB doctor. That was then.